High Tea: Philippines Is World's Best Country In Business English! I got this captured image from the face book wall of a Filipino friend in Vietnam who is involved in an English Language School. I felt surprised and overwhelmed being a Filipino after reading this. I met this Filipino friend when out of boredom from my previous job, I tried to source for a part time teaching job in Vietnam since I am staying in the Cambodia-Vietnam boarder and Ho Chi Min City is only an hour ride from my place of work. My queries were immediately responded and since then, I have maintained a professional relationship with that school with an intention to build up a network within the Filipino community. Before I worked abroad, I was thinking that Philippines does not really offer a high quality education because I've seen a number of protests from the student sector trying to pursue an upgrade in our current educational system. I'm not so sure about all these but when I first came here in Cambodia to work, I had the chance to meet a lot of people from different countries in South East Asia and I am proud to say that Filipinos are by far the most advanced in as far as proficiency in the English language is concerned. Do you know that in International schools in Cambodia, Vietnam and Thailand, they never offer any teaching job to our neighboring countries in South east Asia. Their job ads would read, "English Teachers Wanted: Native Speakers and Filipinos ONLY!" Doesn't it sound so good? Now that Philippines was named first in the world in Business English proficiency, I'm pretty sure that Filipinos will have lot more opportunities working abroad. Well, it's nice to know that amidst all the problems confronting the country, there is still another reason to celebrate. This only proves that we still managed to be upfront as far as human resources is concerned and it will be expected that more and more Filipinos will be seeking for jobs abroad. I do hope that our government will take this in consideration and uplift the living standard of our own teachers in the Philippines. We might have a brain drain soon. This is precisely the reason why despite of the fact that teaching is my passion, I have chosen to join the corporate field in search for a higher paying job. Anyway, this is still a good news for all Filipinos as we will be more competitive more than ever and this means high paying jobs for our countrymen in the years to come. wow.. I am proud to be a Filipino with this post. thanks for sharing. What can I say? But.. "I'm proud of being a Filipino! I'm proud of being a Filipino! Mabuhay!" The happiest news I heard today! Thanks for sharing this Krizza! Indeed this is good news. At least others recognize the abilities of Filipinos. Still, I also agree that we need to level up the quality of education in our local schools. We should strive to be at par with top international universities in the future. We're still a far cry even in our neighboring Asian countries. But I know that it can be done. This news is proof that we can excel. That's amazing! I hope this shift to K12 will further improve the quality of our graduates. this is so true..i'm working abroad also, and most employers prefer Filipinos for receptionist because we can speak clear English. cool. definitely a good news for all Filipinos. yay! This is good news, indeed! Galing naman. I'm sure more people will hire Filipinos online after this. Hi there! I'm a new follower from BC Bloggers and would love for you to follow me back at sugarplumsandlollipops.blogspot.com and pinterest! This is some really good news! A great opportunity for Filipinos! proud to be an English teacher! I agree with Lorlie, poor are getting poorer while the rich, richer. If only our government won't be as corrupt as it is now. But hooray for this news!!! Great post! We are fortunate to be able to get so much nice info about the Philippines. Kahit san talaga ang pinoy magaling =) Good news for all of us! Go Filipinos! This is why I would like to go back to school and study English. We are very adaptable to our surrounding and I think our culture is so westernized that it's easy for us to speak English. No wonder Filipinos are in demand worldwide. I just hope umunlad din tayong mga Filipino, para working overseas would be just an opportunity to share our capabalities, and not a necessity to give our families better lives. Cheers! for this message. Indeed this is very uplifting to all Filipinos out there! Hehe we are better than Indians we surpassed them! Having said that we are far off better to them in English and that is one of the reasons why we have BPO and contact centers in our country. More jobs to the Pinoys and keep it up. I'm always asked by some acquaintances why i chose to teach my kids to talk in English. It's not that I don't love our country and our language. But I know that English will make them more competitive as they grow old and have their own careers. Yes, it should be right that we teach them our mother language but with our situation (living in Germany which is a non-english speaking country) who needs Tagalog? People can say we are the "mabahong isda" in Jose Rizal's famous line but I know in time my kids will learn how important it is to speak in our own language. 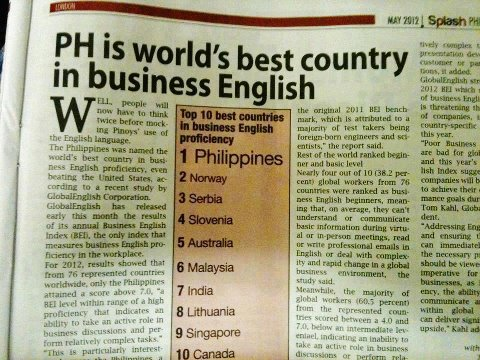 Great to know that in the business industry Filipinos are gaining the favor of being the best English speaking people. Proud to be Pinoy! it is a good news indeed + i bet this will also pave the way for more work opportunities for Filipinos abroad! good news. Sana yumaman ang Pinas sa ganyan! This is a good news for us and the whole county. NIce news about the Philippines. I guess Filipinos are better english speakers than other asian countries. Even the by standers can understand and speak english. They will really try their best to speak up when they were being asked by a foreigner. Great! I think this is true.. I know we Filipinos are really proficient in English compared to other countries..